The percentage of children who experience food insecurity in Missouri is about forty percent higher than the U.S. national average. Food insecurity can reduce the quality of life for young Missourians not only in terms of hunger and nutrition but it can also harm the mental well-being of children. Food security is defined by the United States Department of Agriculture as “access by all people at all times to enough food for an active, healthy life” (USDA ERS, 2015). More than 48 million people in the United States (14 % of the population) experienced food insecurity in 2015 (USDA ERS, 2015). Missouri’s increase in citizens living with very low food security between 2012 and 2014 is the highest in the country (Cafer, Chapman, Freeman, & Rikoon, 2016). Childhood food insecurity is a risk factor for negatively affecting a child’s mental well-being (Slopen, Fitzmaurice, Williams, & Williams, 2010). Food-insuffiecient teenagers were almost twice as likely to have seen a psychologist, have been suspended from school, and have difficulty getting along with others (Alaimo, Olson & Frongillo, 2001). Additionally, food insecurity is associated with an increase of mood, anxiety, behavior and substance disorders (McLaughlin, Green, Alegria, Costello, Gruber, Sampson & Kessler, 2012). 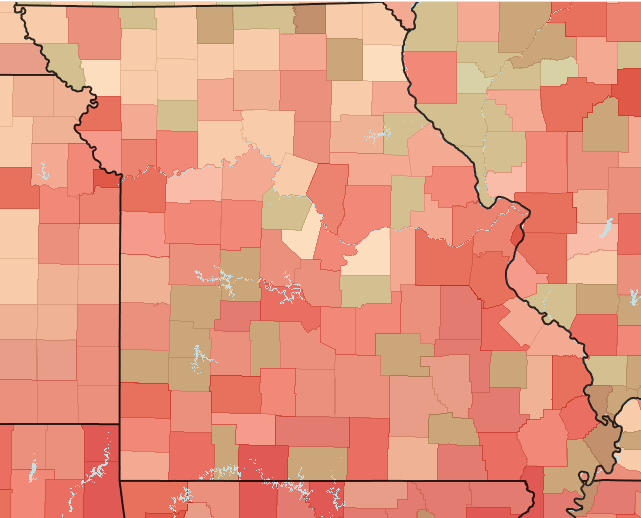 In Missouri, over 20% of children are food insecure. Click the image below to explore childhood food security data from Feeding America for counties in Missouri and across the United States. Data from Feeding America’a Map the Meal Gap, 2014.